We have told many story in the past 10 years, about different members from our big team and their diverse and very special skills and hobbies. Last week, we were more than delighted to find out that one of our employees from our Plovdiv office has written a book! Monika is a young, aspiring author and an adventurer at heart and we are beyond proud of her achievement. This is why we wanted to get a special interview from her to present her first book and tell us more about herself and her talent. Hi Monika, can you tell us a bit about yourself? Hello, I am Monika and I am a travel writer and blogger. I was born and raised in Plovdiv, but parts of my heart are in different places of the world. I guess, I was as little as 3 years old when I started to come up with stories and begged my grandmother to type them on her typewriter. Now, I get to write them myself and writing has been a vital part of my everyday life. A few years ago I even started a travel blog - https://twoandahalfbloggers.wordpress.com/. What was your inspiration for your book about Plovdiv? Plovdiv is such a vibrant and diverse city that I didn’t need to think twice before starting to write about it. You can find inspiration in PLOVEdiv around every corner. But, my love towards the city had a vital part in the writing process. 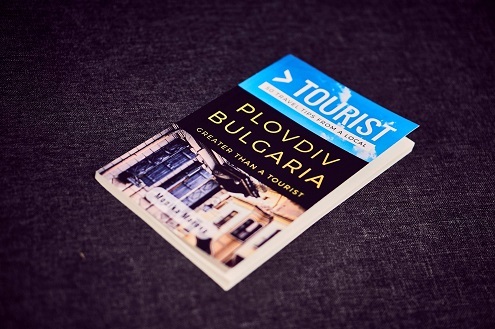 The book consist of 50 tips from a local (Me J) about Plovdiv. They vary from tips on how to get places, through what to see, to what to eat. The book is targeted towards foreigners and aims to help them learn a few things about the place, as well as preping them for their visit. My favourite book is “To Chicago and Back”. Aleko Konstantinov took me on such an incredible, interesting and humorous journey to the USA that I had to go and see it for myself. I still remember walking down Broadway and imagining what it looked like years ago. And what is the process of writing a book? Usually, when writing a book, such as a novel, you will need to come up with a plot, place, characters, and motives. In my case, that was not a novel, and the place and characters overlapped making Plovdiv the protagonist of my story. I made a list of all the things one must do and see here and after that I wrote a few sentences about each of them. Do you remember the first book that you’ve read? Unfortunately, I have no recollection about the first book that I’ve read, but it probably was one of Brother Grimm’s fairytales. If you had the chance to meet one famous author, who would it be? If I had a time machine I would travel back and meet Aleko Konstantinov. There are a few writers I love to read. I think that as a writer I would learn a lot from Steven King. I love Liane Moriarty’s books and the fact that she can tell a few stories at the same time, making them collaborate in such a clever way with a big plot twist at the end that leaves you speechless. Veronica Rot and her fantasy world are really interesting to me, as well as Nora Roberts diverse novels. What would you say to people who want to write a book? To find an inspiration and start writing.